All artwork and designs are the work of Paul Shardlow unless otherwise credited. All images are the copyright of Paul Shardlow unless otherwise stated. No image may be reproduced without permission from the copyright holder. This is titled 'The Contract". It could just as easily be called 'The Bribe'....you can write your own story. But because a gift is involved, I'm using it as my Christmas card this year. 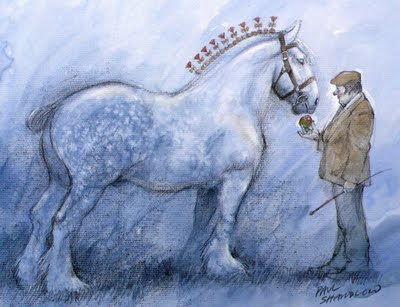 I love the dappled watercolor horse. It's so nice. Mikki, that must have been in Santa Barbera? Big blue horse on foamcore, about six feet across? I hope your son is still enjoying it. Thanks for getting in touch. Happy New Year.